Old Testament Ezra feels exactly right in the twenty-first century. Thanks to Bo for suggesting today’s Baby Name of the Day. The song was called Good, and the artists were a previously little-known group formed back at Louisiana State University. The band is known as Better Than Ezra, and their success helped to quietly push the name back into the spotlight. From 1994 to 1996, the name jumped nearly 150 places in the US rankings, and it’s yet to slow down. As for where the band found the name? They’ve never said. But there’s no shortage of possibilities. The name appears in the Old Testament, sometimes as Esdras. He’s a poet and a scribe, a teacher and interpreter of Jewish law. The name’s Biblical status explains why it’s remained in use over the ages. An early president of Yale University wore the name, as did the founder of Cornell University. It’s the first name of Fitch in Abercrombie & Fitch, too. Before the store peddled goods in shopping malls, it outfitted gentlemen outdoorsmen and adventurers. But this name doesn’t seem scholarly or rugged as much as it leans literary. That’s thanks to two other figures. Born in the wilds of Idaho when it was still just a territory, poet Ezra Pound spent much of his adult life in Europe. His poetry endures, though his political views – he supported Italy’s fascist regime during World War II – ensure that he’s forever controversial. On a happier note, there’s the classic children’s book The Snowy Day. Celebrated author Ezra Jack Keats wrote and illustrated the enduring favorite. It’s even inspired US postage stamps. A literary pedigree and an unusual sound – the razor-sharp z-r, the -a ending – put Ezra on the quirky classics list for years. But as those children of the 90s started families of their own, Ezra continued to climb. There’s well-known journalist Klein, one of the founders of the new site Vox. And actor Miller has become a household name, thanks to turns in the Fantastic Beasts franchise and his role as The Flash in the DC Comics universe, with his own stand-alone movie expected in 2020. Other factors pushed this name higher, too. We’re all about a-ending boy names, with Noah a recent #1 choice, and other names like Luca and Isaiah very much in favor. That high-value Scrabble letter Z helps, too. But there’s one other factor to consider. Disney’s animated series Star Wars Rebels takes place before A New Hope – the first Star Wars movie ever made – but after Revenge of the Sith. He’s Force-sensitive – that is, a potential Jedi – but he grows up an orphan, until he joins us with a band of rebels as the Empire tightens its hold. Bridger proves himself a capable leader, though he struggles to use his power for good. He’s a popular character, and the series has been a success. It first aired in 2014. This has surely boosted the name even higher. The only question remaining is how high will this name climb? It cracked the Top 200 in 2012, entered the Top 100 by 2015, and is now more popular than ever before, with no signs of slowing down. What do you think of Ezra? Would you consider this name for a son? Originally published on June 1, 2008, this post was revised substantially and re-posted on November 29, 2011, and again on December 26, 2018. My oldest is Ezra Wolf! My great grandpa was named Ezra and I have always wanted to name a son that name. I can’t believe that the girls are attempting to steal this name too! There is a culture that names their females Ezra. I think most of you are quite judgmental. I have a baby boy due in one week and have been in love with the name Ezra since day one of pregnancy. The only aggrivating thing is the popularity rising because of the show, Pretty Little Liars. My heart almost broke when I mentioned the name to someone and they replied, “Like the show!” UGH. But I think I’m going to stick it out. I have considered Emerson instead, but love Ezra. The reason why folks thinks Ezra is a girl’s name is because it sounds like a girl’s name. More and more girls are being named Ezra. I don’t understand why so many folks so vehemently and outspokenly seem to abhor Ezra as a girl’s name and then name their little girls things like Taylor, or Kelly, or Shawn. I LOVE Ezra as a girl’s name!!! Ezra’s 3 1/2 now, and I love his name even more today. Don’t tell my other kids, but his is the name I’m most content with. The blogger Amalah has an Ezra and during his pregnancy she wrote a pregnancy calendar for Alphamom. Since both of the Ezras I know IRL where born shortly after Amalah’s, I’ve always wondered if their names were influenced by her column. Ezra Jack Keats is one of my favorite picture books authors, he would make a wonderful namesake. That’s a blog name that fascinates me! I discovered her when she started writing for Babble, but I just realized that’s she’s another Amy! She’s definitely popular enough to have encouraged a few people to consider Ezra … Now if Ike catches on, after the third son? We’ll know she’s a trendsetter! I believe I’ve shared this story before, but I’ll do so again. About a year ago my sister and I were at a cafe that caters to families with young children. We heard a mother calling her young son “Ezra!”, and my sister turned and asked me, the name nerd, whether Ezra was a popular name at present. 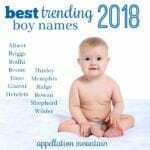 I responded that, while not necessarily popular, it’s definitely on trend for boys, being both a name that begins with a vowel and an Old Testament name to boot. Later during the same day we headed over to a mall to do some shopping and once again came across a mother calling her young child “Ezra!”. The difference was that this time the kid in question was girl. I grinned at Emily and said something to the effect that I guess it’s on trend for both girls and boys. I don’t personally know anyone with child, son or daughter, named Ezra, but I do have two friends with young kids named Azariah, one boy, one girl. I understand that some parents, combing the Old Testament for names, might lament that there are far fewer girls’ names to be found than boys’, but when you look at names as a whole, there are so many more available girls’ names than boys’, it’s a shame that some of these strong-yet-lyrical boys’ names are going to the girls. I had a crush on a boy named Ezra in high school and have loved the name ever since. I see this name as firmly masculine, but several people my age (teens) seem to think it’s a girl’s name. I actually had an argument with a friend after my cousins were born over whether or not it was a boy’s name. Personally I think it’s just lack of knowledge that makes people think this. The popular mindset seems to be that any name ending in a vowel sound is a girl’s name, something I’d really like to see change. Though we only know one little Ezra, we do know two little girls, born about a week apart last year, both named Ezri. 🙁 maybe that’s where the confusion comes from…? I love Ezra, but then there are very few biblical names I don’t like 🙂 I have a thing for E names and I think Ezra and Enoch would make a beautiful sibset. However I doubt I could use a name that jumped 100 spots in only 3 years, yikes! I really don’t get how people think that Ezra is feminine, but I guess there is far less biblical knowledge than there used to be. Ezra’s great. I worked for Cornell U, so Ezra’s definitely male in my book. There’s a little Ezra in the girls’ preschool class, and 2 Lucases in their preschool. You could always try Elisha. Similar in sound, popular but not too common, and definitely not trendy. Where do you live? I live in NY, and know a boy named Camden, and all I can think of is Camden, NJ. I suppose if I lived a little further south it would be Camden Yards. I think it’s a better name for people who live off the East Coast. Funny, I bumped into an old high school classmate at a friend’s baby shower and she had a little 4 year old girl named Ezra. I was mortified but managed to cover it up and mentioned that Ezra Pound was one of my favorite poets, and commented on “how unique it was to give the name to a girl!”. She gave me a weird look and said that how she picked it out was- when she was pregnant with her Ezra, she came across a sweater in the female section at A&F and inside, it said “Ezra Fitch”. She assumed it was a girl’s name and took it from there. After further conversation, apparently she has never researched her daughter’s name once and had no idea it was a male name. How some people can do that, I don’t know. I know a few people who gave little to no thought to doing name research, barely even picking up name books, let alone doing any online research. For every name nerd, there’s a name…bimbo? We do think of bimbo as the opposite of nerd, don’t we? LOL Name bimbo!!! I am so using that on my husband! Ezra is on our very short list for a boy. We went to LSU and love the subtle references Better than Ezra makes to our alma mater in their lyrics:-) To me Ezra is one of those ‘diamond in the rough’ names. I’d heard it my whole life without ever considering it, and then one day I saw it in your archive and it hit me like a ton a bricks; all shiny and new. I love it’s quirky sound and biblical reference, and it sounds great with our last name. My only reservation is how quickly its rising up the charts. I love soft names way more than hard names for boys. Give me Ezra and Noah over Colton and Hunter anyday. I first heard of Ezra on a TV show called Higher Ground. It didnt really strike me as feminine if I think about, since I didn’t bat an eyelid. I think -ah names are on trend, but I’m not sure if it’s at its most popular. Ira and Alva from the 1800s come to mind, Dana, Elisha, Ezra and Asa have been used for a long time too. Joshua is definitely the most popular ever, with probably Dakota right behind. There are others also, but with lesser usage, such as state names Indiana and Montana, Shia and Shaya, even Kaia I’ve seen on a boy. Nikita, Nikola and Nicola are actually more used on boys in the US than girls, that surprised me.Then there’s the exotic names, Krishna, Kekoa, Kainoa, Indra, Akira, Mustafa, Hamza, Sasha, Misha, Mattia, etc.. And of course nouveau inventions (I think) like Koa, Koda, etc…. Oops how did I leave out Luca/Luka? Those are definitely reaching for the stars, although I do think as long as Lucas/Lukas is around, they’ll always be the bridesmaids. Getting really fed up with my phone. I posted a comment using my new phone, but it didn’t show up. That’s just the 3rd or 4th time this has happened. I first came across Ezra when learning about Ezra Pound in American English class in highschool…I loved the name the first time I heard it because of everything you’ve mentioned…the unusual -a ending for boys paired with the spunky Z is adorable. Ezra would fit right in a small country town or in a chic metropolis. I think Ezra is getting ready to jump up a few places due to Ezra Fitz the name of a character in the pretty little liars book and television series. Along with Aria and Spencer on a girl. I agree. It will definitely jump due to the hunky Ezra Fitz. It enlightened a lot of people that this really is a boy name! I’m a huge fan of the name Ezra. I was one of those who thought Ezra was a girl’s name years ago. Mind you, I was probably 12 or 13 at the time, but still. I think it would work fine on a girl, even as I know Evans, Michaels and Noahs that are women. But it does work best as a boy’s name, to me. Unlike Ira. I want Ira firmly on the girl side and no one seems to agree. Ira is definitely all male to me. I personally dont think names like Evan or Michael work well on a girl at all, but each to their own. Whether we think of a name as male or female or both has a lot to do with if we know anyone with that name, in my humble opinion. I have a wonderful male, Jewish colleague in his 60s named Ira so there is no way I could ever picture Ira on a girl. But with no frame of reference for a name, we only have our own intiution and cultural sound conventions to go on. Ezra is a really handsome name, and very strong-sounding. I would definitely consider it, except I probably screened it out through other name choices. Kudos to anyone who chooses this name though. I can’t imagine that someone would actually name their daughter Ezra lol. 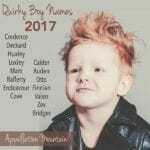 Its not a bad name – for a BOY. Its way too harsh sounding for a girl + it has so much history as a hebrew male name. There are so many pretty girl names out there. Why use ezra? Might as well just name your daughter Noah or Harry lol. Your post actually reminded me of something. Once I was in a park and there was a little boy named Kelly. An older irish man who was there with me at the time said “wow so refreshing to see Kelly on a boy. If you name a girl Kelly you might as well name her Patrick”. Pretty much what you said here haha but with other names. I have a son named Ezra, born in 2001. I knew the name was somewhat unusual, but I have been taken aback by how many people say they have never heard the name – people who go to church regularly!! The only people we have run into who have thought it was a girl’s name are from India. I understand there is an Indian girl’s name that sounds almost like Ezra. Ezra is a nice boy’s name, but it’s so awful on a girl. It’s too bad that some people just don’t get it and think that, just because it ends in an “a”, it’s a girl’s name! I feel bad for any poor girl who is unfortunate enough to be named Ezra. I think Ezra is beautiful, in fact it is the name of my baby born February 2008. It is a name that is resurfacing after being uncommon for many years. I have heard it’s a girl name, but I quickly point out its biblical origin. Many people who do not read the bible do not know this because it has not been common for quite some time. I used to know a girl named Ezra, and another one named Azrah. I just makes me weep! 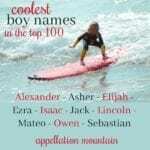 Ezra is one of my favorite zippy boy names, and it’s a plus that my husband loves it also! He loves the band “Better than Ezra”. 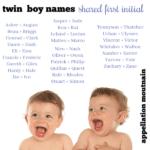 I have always secretly dreamed of having twin boys named Ezra and Boaz, both biblical, both four letters with the cool letter Z, it would be just so cool! Congrats on your darling Ezra! So nice to hear about a boy with this name. Funny how the universe conspires … who knew that I’d posted it on his birthday? I have run across someone suggesting Ezra as a girls’ name, but I choose to believe that she was just kidding. I’m not strongly against using masculine monikers for girls, I just can’t see why anyone would bother when there are so many great feminine choices out there. My Ezra was born on the very day you posted this! I continue to fall deeper and deeper in love w/ his name and am so glad we went w/ it. I think people will get more familiar w/ the name considering the rise of the -a(h)s that you wrote about in another post and also the growing popularity of less common biblical names. I am positive that many of the reactions I have received are due to my area, also known as Where Names Go to Die. 😛 I receive some of the nicest possible compliments on Ezra’s name by those people who “get” it. I will fully disclose that I <3 biblical names, if you haven’t gathered so already. 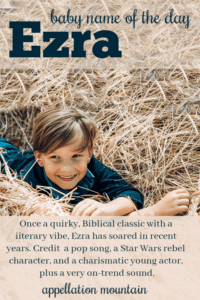 […] Ezra – I love Ezra, with his razor-y sounds and Biblical origins. […] his sparer version Efrem – but they have some very attractive qualities.